Zoey always tries to keep an open mind about clothes. Can she do the same for people, too? Includes “Sew Zoey” blog posts and fashion illustrations. 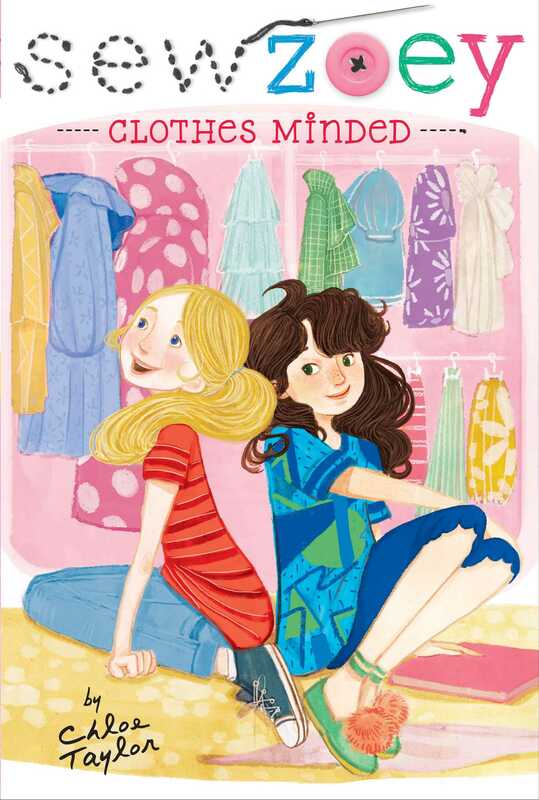 In the eleventh book in the Sew Zoey series, Zoey Webber thinks she’s helping when she gives advice to a boy who has a crush on her best friend Kate. Zoey tells him to wear a soccer jersey from Kate’s favorite team, assuming that Kate will like him better if he’s into sports. Kate finds out and feels betrayed that Zoey thinks she is so closed-minded. Meanwhile, Zoey helps her new friend Sean start a fashion club at school, promising to allow anyone to join. But when someone unexpected shows up to the first club meeting, Zoey struggles to stay true to her ideals and keep her focus on the clothes. Could Zoey be the one who is closed-minded, after all? Hello, readers! Your friend Zoey is suffering from a big dose of reality at the moment. Everything seems so calm and almost boring after the flurry of planning Aunt Lulu’s surprise wedding (in only three weeks). Now that the wedding is over, it’s like I’d forgotten what normal life was like with just school, homework, friends, designing and sewing, my blog . . . Oh, yeah—I’m actually still pretty busy! Anyway, I’ve always wanted to learn to knit, so I just started teaching myself with a book Aunt Lulu gave me, and I’ve already tried to make a few things, including the scarf in this sketch. My next project might be mittens with different-colored thumbs, but I’ve heard that gloves and mittens are very difficult! Do any of you knit? If so, please post your helpful tips in the comments! And stay tuned for the (hopefully cozy) results of my knitting projects . . .
Monday mornings were difficult for Zoey Webber. Not because she had a hard time waking up (although she did), and not because she disliked school (she liked it very much), but because her weekends were always so much fun. She spent time with her friends, made pancakes with her father and older brother, and spent hours and hours working on new sketches and designs for her Sew Zoey label. So even though Zoey was pleased with her Monday morning outfit, which included a skirt made from the top of an old pair of her brother’s jeans that she’d stitched to a length of green floral fabric, she found herself sitting in home ec with her chin propped up on her hands, feeling like she was in a bit of a postweekend slump. One of her best friends, Priti Holbrooke—whose recent penchant for dark, Goth clothes was at odds with her loud, sunny personality—breezed into the room. She complimented Zoey’s outfit before plopping down beside her and pulling out her phone to send a text message. Seconds later, Sean Waschikowski, a relatively new friend of Zoey’s, plopped down on her other side, even though his assigned seat was across the room. The bell for class to begin was about to ring. “Hi, Priti, hi, Sean,” Zoey said, her chin still in her hands. She couldn’t help wishing she’d been able to sleep in that morning. Even though it was only early fall, the cooler mornings made her want to stay in bed longer. “You look glum, chum,” Sean said. Zoey’s ears immediately perked up, and with them, her mood. “What do you have in mind?” she asked. “Then why is it called a fashion club?” Priti asked. “Hmm.” Zoey still wasn’t sure. She doubted starting a new club was as easy as Sean was making it sound. Priti snorted. “And we all know how that turned out,” she said, referring to Zoey’s new uncle’s wedding band falling out of the pillow’s pocket and getting lost during the ceremony. Uncle John used Mr. Webber’s wedding band for the ceremony, and they didn’t find the original wedding band until after the honeymoon. “Do the club,” Priti said, refusing to let Zoey change the subject. Zoey looked back and forth between her old friend and new one, both of whom seemed positive the fashion club and Zoey Webber were destined to be together. Zoey agreed to meet Sean at school on Tuesday morning to start working on his idea. Sean had made an appointment for them to meet with the principal, Ms. Austen, before homeroom to find out if it was even possible for them to start a new club. Zoey’s brother, Marcus, dropped her off early, so early that the school was eerily silent, and many of the classrooms didn’t have their lights on yet. She felt like she had to tiptoe and speak softly in the hallways. She was relieved when she caught up with Sean by his locker and was no longer by herself. Together, they walked to the principal’s office. “You ready?” he asked Zoey. She nodded, not wanting to say out loud that she actually had a few butterflies in her stomach. Even though Zoey had a great relationship with Ms. Austen, who was an admirer of Zoey’s designs and blog, Ms. Austen was still the principal, and talking to the principal always felt like a big deal. Sean knocked boldly on Ms. Austen’s door. “Come in!” Ms. Austen said, opening it and ushering them toward the chairs facing her desk. Zoey and Sean had talked on the phone the night before, and he’d rehearsed what he was going to say. Zoey thought it sounded great. Evidently, Ms. Austen did too, because she sat back in her chair, nodding and looking quite pleased. Zoey noticed Ms. Austen was wearing a beautiful vintage Diane von Furstenberg wrap dress and bright blue t-strapped heels that day. If anyone would be sympathetic to their cause, it would be her. Zoey hadn’t even thought about the club needing a budget. But she supposed that field trips and materials and whatever else they might need would cost money. Zoey had her sketchbook with her, as always, and whipped it out to jot down notes. To Zoey, the list was already starting to sound like a bit more than she’d anticipated. But Sean was leaning forward in his seat, a huge smile on his face. Zoey and Sean exchanged a look. She couldn’t help feeling bolstered by the principal’s enthusiasm. It would be neat to do something totally unique at Mapleton Prep. After all, it wasn’t the first time Zoey had done something most twelve-year-olds hadn’t, including being a judge on the TV show Fashion Showdown, making a wedding dress, and having a famous Hollywood starlet wear one of her designs. Starting a club would seem like a piece of cake compared to those things. A bell rang, signaling that students had three minutes to make it to homeroom. Zoey and Sean gathered up their books to leave. Sean and Zoey left the office, moving swiftly in the direction of their homerooms.